This week we’re taking a look back at mistakes made in Iraq from an insider’s perspective. 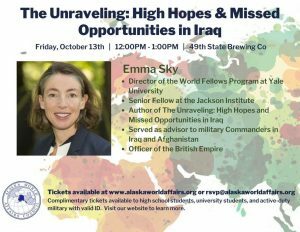 Emma Sky, author of “The Unraveling:High Hopes and Missed Opportunities,” and Director of the World Fellows Program at Yale University, discusses how both internal and external political forces caused the mission in Iraq to fail and created lasting instability in the whole region. David Ramseur, chair of the board of the Alaska World Affairs Council, provides the introduction. RECORDED: Friday, October 13th, 2017 at 49th Brewing Company. Addressing Alaskans features local lectures and forums recorded at public events taking place in Southcentral Alaska. A variety of local organizations host speakers addressing topics that matter to Alaskans. To let us know about an upcoming community event that you would like to hear on Addressing Alaskans, please Contact Us with details. SUBSCRIBE: Get Addressing Alaskans updates automatically via email, RSS or podcasts.